The organic chicken market is likely to witness a notable shift from traditional selling to chain stores and online selling channels. Manufacturers can leverage the strength of retail chain stores to establish brand visibility in a bid to enhance sales. Moreover, online stores are also expected to gain significant traction as manufactures can tap remote consumers and enhance their sales funnel. Fact.MR reveals that the sales of organic chicken via chain stores are likely to grow at a meteoric CAGR of 14.7% in terms of value during the period of forecast, 2018-2028. However, sales of organic chicken through direct sales are estimated to surpass other channels, says the report. Demand for organic chicken is likely to spearhead across various countries on the back of increasing demand for organic food products as opposed to traditional products. Fact.MR envisages that the sales of organic chicken worldwide is likely to cross US$ 7,500 Mn by end of 2028 with increasing demand from emerging countries. 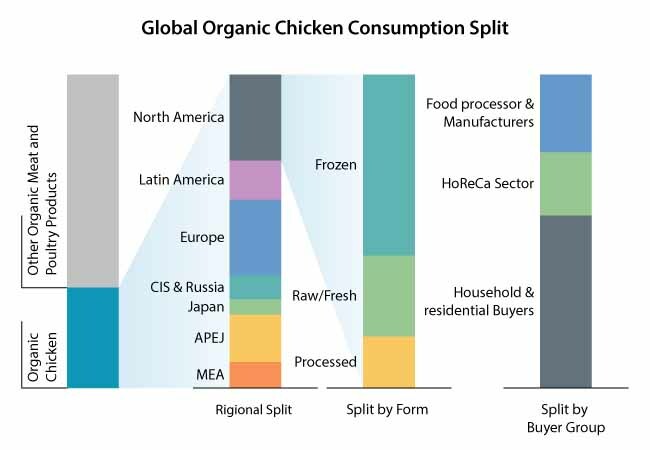 Sales of organic chicken are expected to remain concentrated in the developed countries of Europe closely followed by emerging economies of Asia Pacific excluding Japan (APEJ), physical fitness being a common and a key aspect observed in these regions. Strong fitness industry of Europe is likely to present potential opportunities with rising people participation in fitness clubs. For instance, according to IHRSA, in 2017 European health club market served around 56 million members with fitness clubs generating more than US$ 29 billion. This has translated into increasing demand for high protein natural food products such as organic chicken, in turn boosting its market’s growth in Europe. Likewise, APEJ, largely driven by the Fitness 2.0 trend, has witnessed growing inclination toward pure protein source, consequently fuelling demand for organic chicken, which is projected to expand at a rate of 10.3%, particularly in China, Australia and New Zealand says the report. Demand for organic chicken from household and residential buyers are expected to swell at a significant rate, making them a lucrative buyer. Growing household size worldwide has played a vital role in pushing sales of organic chicken. For instance, according to Office of National Statistics, in United Kingdom, 2017 reflected a 15 percent increase in households. Likewise, number of households in United States crossed 126 million in 2017, as per the analysis of United States Census Bureau. Moreover, rising purchasing power parity is expected to complement the growing sales of organic chicken in these countries. Furthermore, growth of the organic chicken market is also influenced with a significant demand from the HoReCa sector, albeit at a relatively lower base. High prices associated with organic chicken production is likely to remain as a confining factor restricting the growth in sales of the produce. Organic chicken production is carried out under strict guidelines provided by the regulatory bodies including USDA (U.S. Department of Agriculture). Regulations such as 100 percent organic feed for poultry, prohibition on use of antibiotics and other growth enhancers for instance, steroids, have resulted in high prices of organic chicken. For example, according to United States Department of Agriculture (USDA), traditional boneless chicken breasts are priced at US$ 2.5 per pound whereas their organic counterparts are priced at around US$ 7 per pound, which is expected to confine its sales. In addition to high pricing, several fraud cases have been registered, which is expected to hinder the growth of the organic chicken market. Shift from free-ranging to confined poultry operations has been witnessed in the organic chicken market. Confined poultry operations facilitate a robust bio-security level on the back of zero contact between chickens and other animals. This can significantly reduce the probability of acquired diseases and physical injuries, consequently favoring organic chicken health. The movement toward confined poultry activities is expected to provide potential avenues for producers of organic chicken in the coming years.